When European traders began to buy huge amounts of North American furs to sell in Europe and China, Algonquin hunters began to trap and hunt lots of animals, especially beaver, to get their fur to sell to the European traders. The Algonquin got in many wars with the Iroquois to their south and west over land and over the control of the fur trade in the 1500s AD. What were the Iroquois doing? As a result, the Algonquin seem to have pushed the Iroquois further south and forced them to pay tribute. The Algonquin probably controlled land as far south as the upper Hudson river valley (in modern New York State). 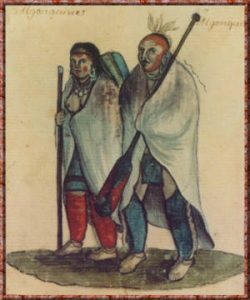 In 1570, the Algonquins formed an alliance with the Montagnais people to their east, and after that the Algonquins and the Montagnais people fought the Iroquois together. By 1603, the Algonquins were not doing so well. They kept losing battles with the Iroquois, so they couldn’t travel safely on the St. Lawrence river. But the new French king, Henry IV, wanted to build alliances in America. So in 1609, Samuel de Champlain made an alliance with the Algonquins. He agreed to help the Algonquin fight off the Iroquois. 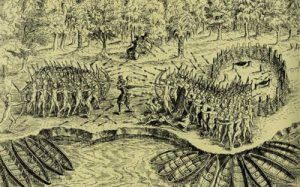 French guns killed two Iroquois chiefs, and the rest retreated, afraid of the new weapons. The Algonquin couldn’t convince Henry IV to give them any guns, but they did get steel knives and other weapons. With these the Algonquin, under their general Pieskaret, pushed the Iroquois further south. Now that they had some southern land, the Algonquins began to grow a little corn and beans, but they were really too far north for successful farming, and they got most of their corn and beans by trading with the Iroquois or with the French. Where do beans come from? By 1629, the Iroquois had trapped all the beaver in their own land (modern New York State). So they wanted to expand their hunting land to the north. That meant moving into their old land in Canada, where the Algonquins lived now. The Iroquois got steel weapons from their Dutch trading partners and attacked the Algonquins. Because the French leader Richelieu was busy with the Thirty Years’ War, and didn’t help the Algonquin, the Iroquois won. The Algonquins lost all their southern land back to the Iroquois. What’s the Thirty Years’ War? In 1632, Richelieu finally did sell guns to the Algonquins, to try to help them get back the land from the Iroquois. But there were not enough guns and the guns were not good enough. At the same time, French Jesuits began to convert people to Catholicism. Newly Christian Algonquin people got in fights with their leader, Tessouat, who stuck with Algonquin traditional religion. That also weakened the Algonquin. Many Algonquins died of smallpox in 1634. By 1650 the Iroquois had gotten much stronger than the Algonquin, and the French queen Anne was not helping the Algonquin anymore. The few survivors were scattered in small, weak groups. In 1667 Queen Anne’s son Louis XIV finally sent guns and soldiers to fight off the Iroquois. Now the Algonquin were able to trade furs again, but there were only about 2000 of them left. Another epidemic in 1676 and 1679 killed off even more of them. With peace, their numbers slowly increased again. In 1760, when the British conquered Quebec, the Algonquins gave up their alliance with Louis’s great-grandson, Louis XV, and became allies of the British instead. Because they were allied with the British, Algonquin warriors fought on the British side in the American Revolutionary War. But the British lost the American Revolution. So in the 1800s, thousands of British settlers chose to leave the United States and moved north on to Algonquin land. There they began in the 1840s to cut down the forests in order to sell the wood. This ruined the Algonquin hunting grounds. Algonquin people had to move onto smaller and smaller reservations. 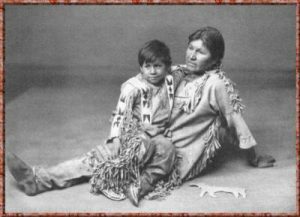 Canadian-European people forced many Algonquin children into government-run boarding schools where the teachers forced children to speak English and often abused them. Today most Algonquin people still live on what’s left of their original land, near Quebec in Canada. Many still speak Algonquin, with a lot of words borrowed from Cree. Many still gather wild rice. But as a result of colonialist abuse, they’re mostly not very well off now. Did you find out what you wanted to know about the Algonquin tribe? Let us know in the comments! Cite this page: Carr, K.E. Algonquin tribe during European colonization. Quatr.us Study Guides, August 12, 2017. Web. April 23, 2019. I’m delighted to hear it, Abby! Did you see our page about the earlier Algonquin people at https://quatr.us/nativeamerican/algonquin-history-native-americans.htm? I’m glad you liked it, Abby! Hi Addison! Thanks for stopping by!